From time to time I like to share this recipe because it’s been my staple breakfast for at least years now. Every. Single. Day! Never felt better! 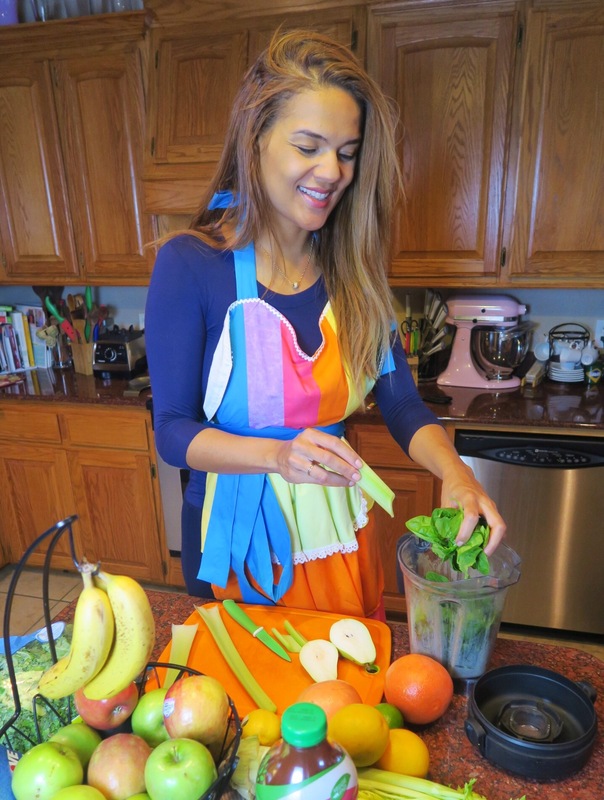 My Daily Green Smoothie wasn’t born out of nothing, but out of the fruits and veggies I blend daily!! This is perfect for those people unfamiliar with smoothies and want to get into the habit of drinking them. Also a great way to get all your fruit and veggies worth in one serving, can’t beat that! Check this out. Disclosure⭐️: mine is usually served in my to go cup and I have it on my drive to work. Makes two, 16oz smoothies: One for me, one for Winecoach! Tip: a high speed blender works best! This entry was posted in Smoothie Party and tagged green smoothie, healthy green smoothie, my daily green smoothie. ← 13 weeks – Ending the first trimester strong! Yes you can! We all can! We need to motivate each other! Hi Ana! It’s Cristina from snapchat! ??? Your recipe for your green smoothie inspired me to kick start my better eating habits, I’m doing this because I want to help my parents (especially my dad) with eating healthier. I’m Dominican, so just like yourself with your Brazilian heritage, our food is always delicious but not always the healthiest of choices! First I do want to send my condolences to you again, on your fathers passing. Just have the piece of mind that he’s in a better place now & he’s still loving you & watching over you! My dad was diagnosed with prostate cancer a few years ago & he now has to be on a vegan diet, no animal protein at all! So this smoothie is something I want to intagrate into his diet! But I have a few questions for the smoothie! Do you have a certain time of day that you feel is best for drinking the smoothie? Meaning only for the start of your day or can it be used as a meal replacement? I ask this, because it leads to my next question.. What are your thoughts on or do you think it’s ok to add protein powder to the smoothie? Because for myself, I was thinking of having my smoothie after a good workout, with adding protein to it! My other question relates to “the most important meal of the day” > breakfast! I’m horrible at eating a good breakfast because I work full time, I’m a law student & I’m always helping my dad a lot. So breakfast for me consists of a nice large cup of coffee lol! So since I don’t have lots of time to be home & cook, what do you recommend on me being able to do or make super quick & easy, but that is a good hearty, & healthy breakfast? Thank you for your time! Love your blog ? Hi Cristina! Thank you so much for all the nice things you said. I appreciate it from the bottom of my heart. As far as taking care of your daddy, kudos to you!! Sounds like he’s in good hands. The green smoothie is always my first meal of the day, as you can see on snapchat everyday 🙂 Yes you can add protein to it, for him, I would probably add a Vegan protein such as pea protein which will do the trick. For you, I recommend one of my muffins, so search under cakes and breads – My one step banana blender cake would be great for you and you can take it on the go on your way to school. Just make a bunch of muffins, the stuff I have on here is pretty healthy and filling. Thanks for sharing all of this with me! Take are of you and your family! Thank you so much for the advice!! I will definitely look into the vegan protein for my father & I truly appreciate the kinds words from you! I do see that you have 1st thing, so for my dad I will have him & my mom drink it in the morning & as for me I will definitely be trying to make it as my refuel after a good workout on my days that I’m at the gym & the other days just in the morning! Hope your healing & recovering well! I was just wondering if it would be OK to prep the ingredients for the smoothie & just freeze them so that way it’s easy to just grab a smoothie pack & blend & go? Totally! Someone asked me this yesterday. You can make little packs and freeze if you’re prepping for more than 3 days. Sounds like you got a plan! Hi Ana!!! I follow you on snapchat and follow all of your posts on colorful foodie! I have a question about the green smoothie.. I would probably only be making the smoothie for (1) so I’m wonder how much should I add so that the rest doesn’t go to waste. I would appreciate your reply as I am really looking forward to replacing my coffee in the morning with the smoothie. Thanks!! Yes girl!! Do half of all the things I said here. Be ready for a hefty portion though. The recipe on here makes 2 portions at 16oz each! So like a “grande” from Starbucks! ?? ?